Balanchine’s diversity and range were on display Friday night in The New York City Ballet All Balanchine Short Stories program. The three works ranged from La Sonnambula, a mysterious tale in the 19th century Romantic genre, Prodigal Son, a classic story of redemption and forgiveness from the bible, to Slaughter on Tenth Avenue, a fun, silly, fast moving Broadway piece about a stripper and tap dancer. Balanchine choreographed La Sonnambula in 1946 for Ballet Russe de Monte Carlo with music by Vittorio Rieti. New York City Ballet first performed it in 1960 with Allegra Kent and Erik Bruhn (Allegra was in the audience Friday evening). The ballet has 19th century era sets and costumes. The ballet opens with a regal party scene as the Poet (Robert Fairchild) joins the party. All eyes are on him as the host of the party, the Baron (Justine Peck) introduces him to the Coquette (Faye Arthurs). The Poet and Coquette flirt and dance, then sit and enjoy divertissements. The second divertissement was an interesting pas de deux with Lauren Lovette and Craig Hall, similar to the Act I Nutcracker Moore dance. It featured a section where Hall promenaded Lauren around while doing jetes. Troy Schumacher did a reasonable job as the Harlequin, which featured multiple split jumps; the solo had a sense of humor as in several sections in the solo, the Harlequin paused due to back pains, then recovered and resumed dancing. The solo ends with a horizontal dive off stage, hopefully a gentile landing on a gymnastics crash pad. I enjoyed the intense interaction between Fairchild and Sterling; Fairchild is mesmerized by the mysterious Sleepwalker as he tried to interrupt her trance. The two also did a nice job in Duo Concertant in the Black & White program. Next was Prodigal Son (1929) to music by Prokofiev. Serge Diaghilev, founder of Ballets Russes, hired Balanchine in 1924 and Prodigal son was Balanchine’s last work for for the company’s final Paris season. The story is derived from a biblical parable from the Gospel of Saint Luke. Russian poet, dancer and Diaghilev advisor Boris Kochno added dramatic material that emphasized the theme of sin and redemption. Daniel Ulbricht was the Prodigal Son, Maria Kowroski the Siren, and Jonathan Stafford the Father. Daniel opened with an energetic solo filled with high leaps and controlled multiple turns. He stomped around the stage opening his mouth wide as if to say, “I am a spoiled brat.” The Father attempted to moderate his son’s self-indulgent rant, but to no avail. The Prodigal initially made friends with the grotesque-drinking companions that hideously stomped their way on stage. However, sensing danger, he tried to escape but was trapped by the strange bald creatures. They beat and striped the Prodigal bare and, as a final insult, the Siren stole his amulet. A single light focused on the bloody, near-naked Prodigal standing against a table, with everything taken from him. The pathetic stripped Prodigal crawled away for the long journey home. Using a wood pole to aid his crawl, the Prodigal finally arrived home. The father sees his battered son. In an iconic ballet moment with inspiring music of redemption, the father embraced his son and lifted him like a baby, protecting his son with his cape as he carried him home. Daniel excels at bravura steps like tours and pirouettes, but I wondered if he could pull off the dramatic part of this role. I thought his rendering was very good, particularly his return home and his shamed reaction when reunited with his father. In complete contrast to Prodigal Son, the comical Slaughter on Tenth Avenue ended the program. It was created for the 1936 Rodgers and Hart musical “On Your Toes.” This was the first of four Rogers and Hart musicals Balanchine choreographed in the 1930s. According to the repertory notes, Slaughter is a parody of Broadway, Russian ballet, and the mob. It is a performance within a performance as it opens with a jealous Russian dancer (David Prottas) who hires a mobster to kill a rival during a new ballet. The new ballet is Slaughter on Tenth Avenue, about patrons of a sleazy strip joint near the waterfront in a rough area in New York City. 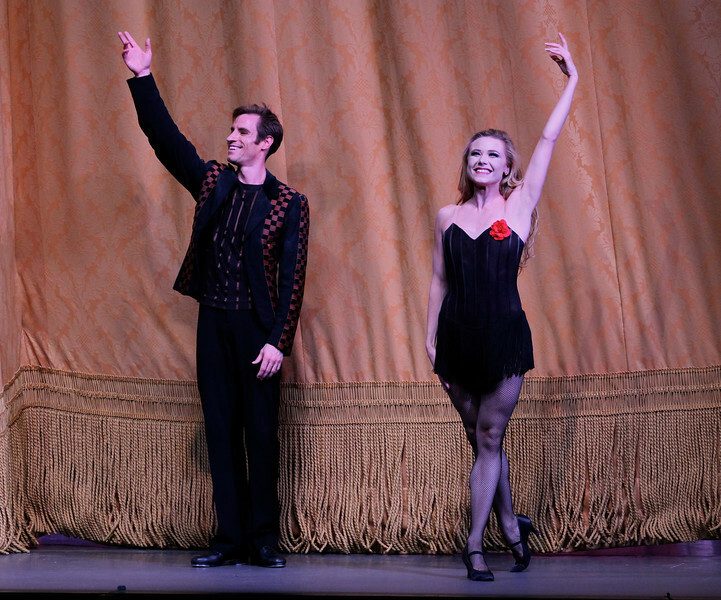 The Hoofer (Andrew Veyette) falls in love with the Stripper (Sara Mearns). The Stripper is discovered with the Hoofer and the Big Boss (Justin Peck) accidentally shoots her. The actress Stripper somehow sends a note to the Hoofer to reveal the real murder plot. The Hoofer, aware that the thug (sitting in the real theatre balcony) will shoot him when he stops dancing, keeps repeating his last line until the police arrive. Sara Mearns was spectacular as the stripper. In a short black dress with string skirt, fishnet stockings, high heals, and blond hair flowing down to her shoulders, she paraded around the pink stage, hand on hip, strutting her stuff. Not typical fare at the ballet, but audience members (particularly the men) didn’t seem to mind. Andrew Veyette as the Hoofer demonstrated his proficient tap dance abilities in several high-energy solos. I thought I had a long walk back home from Times Square-until I realized that I was at Lincoln Center.